We’re in the peak of summer, the sun is shining and everyone’s in high spirits, so what better way to celebrate than with a Summer Garden Party? Join us here at Fremlin Walk from 18th-26th August for a week filled with entertainment, activities and all things summer! 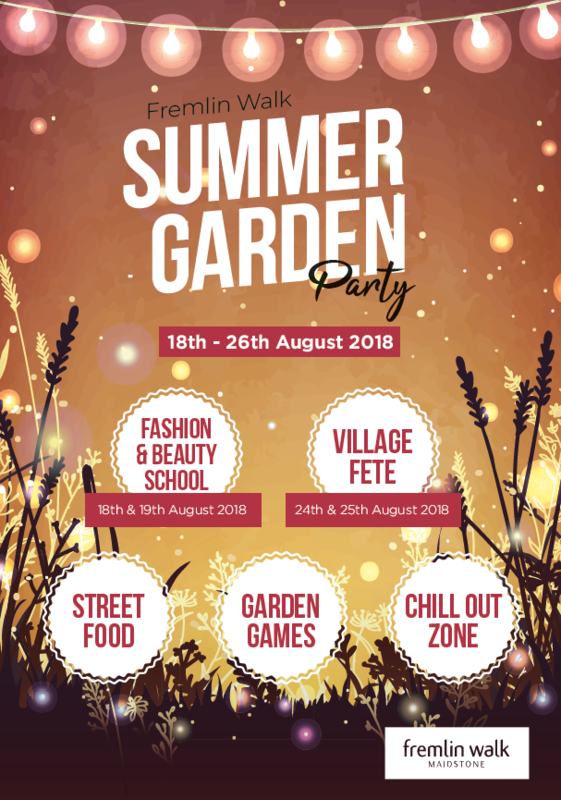 Expect delicious summer themed street food, a grassed area designed for chilling out, garden games and interactive activities. The summer activity kicks off with our Fashion & Beauty School hosted by ITV’s award winning international Personal Stylists, the Style Doctors. The final weekend, it’s all the fun of the fair with our family friendly Village Fete events, with tons of games and prizes to be given away! On Saturday 18th & Sunday 19th August the Walk will be transformed into fashionista heaven with the Style Doctors. There will be a style hub providing fashion advice, personal styling sessions, beauty tips, demonstrations and showcases, so if you’re looking to update your look or get some FREE style advice, this is an event not to be missed! There will also be exclusive competitions and tons of store offers available to make treating yourself to your new autumn wardrobe all the more enjoyable! The following weekend, on Friday 24th & Saturday 25th August, will welcome a family friendly village fete with tons of opportunities to win great prizes. Our Village Fete is the perfect weekend trip for the whole family, complete with free face-painting and competitions! So book the dates in the diary, because the Summer Garden Party here at Fremlin Walk is what’s hot this summer!